Before I start rambling about food I've eaten, I thought I should point out some of the changes I've made to the blog recently. I've added a Google Reader module that contains items from other blogs, which I've shared from my reader and I think are worth checking out. I've also added a del.icio.us module so you can see what sort of things I've bookmarked recently. I'm working on migrating some things over from my original web page, so there are some new links that started out there, but may have new content. Finally, I've added a new subscribe button to make it easier to read this blog in a syndicated format, in the aggregator of your choice. Note that this feed does not currently contain the comments. Sunday morning, I had brunch with AE at Nosh. Look at those yummy buttermilk pancakes. 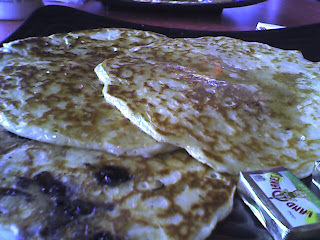 I woke up craving pancakes and they just happened to have a pancake special. Sunday night, I cooked dinner for my dad. I was feeling experimental, so I made spaghetti sauce out of Paul Newman's tomato sauce, a can of whole soybeans, a foil packet of (effectively) canned salmon and ginger. I have yet to figure out how much ginger you need to add to something to make affect the flavor substantially, so I should probably look at some recipes that call for it. 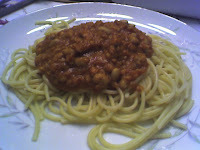 Well, my dad deemed the dish "interesting" which he later updated to "not that bad". I think it was really ok after adding half a cup of parmesan to my serving, but I haven't been eager to eat the leftovers. I'm not sure how long Pauly Dogs has been on Duke's campus, but I've avoided it since I don't eat beef and I love hot dogs. On Monday, I decided to be brave and try my first veggie/soy dogs since my previous valiant and unsuccessful attempts a couple of years ago. I ordered one with sauerkraut and spicy mustard and Paul(y) thought I had to be a yankee. He seemed quite surprised that I'm not, but I did explain that I'm half-German. So, it was actually pretty good. I was impressed. The dogs were made by Morningstar Farms and either I've forgotten what hot dogs taste like in 3 years or the texture was actually pretty accurate. I'm pleased, because it's nice small lunch that's comparatively inexpensive and the cart is just across the Bryan Center Walkway from the "Passion Paradise" smoothies at the Keva Juice cart. Monday night, I went to a computer science faculty candidate recruitment dinner at SR's house. It was fun talking to people from the department and TN has beautiful tropical fish tanks. I had lunch at the Refectory with NP yesterday We ended up sitting near and talking to Debbie Moose, a writer who specializes in food. I told her that she had my dream job, but I don't think she knew just how serious I was! I had chicken pot pie and it was great. It certainly rivaled, if not surpassed, the chicken pot pie at the Nantucket Cafe and the style was very similar. Last night, my dad and I went to the monthly Durham FM Association board meeting. I actually enjoyed this one, because it was held entirely at the Bennet Point Grill, the way it used to be. The service was uncharacteristically slow and the fried oysters in my usual Caesar salad were much cooler in temperature than I would have liked, but the meeting was short and we had a fun crowd attending. Right now I'm watching the Duke v.s. Maryland basketball game, including the commercials. I know this will be unpopular with many of my geeky readers, but I think that the realistic violent video games that they are advertising these days, particularly those that turn on-going military conflicts into "games" are sick. I wonder how much money the pentagon is funneling into the industry to boost recruitment, if not accuracy. Good News! After all these months, I finally determined what was causing the annoying popups. It was my webstats4u counter. Webstats4u bought out nedstatbasic a while back and they added popups at the same time. I was not aware of this and had attributed the popups to something else. Sitemeter is far better anyway, so I'll be removing all my other counters on my website. I apologize to all my readers who had to close the pesky windows for so long. The take-home message: Beware of Webstats4u. Yesterday, at the weekly Visualization Forum, Jeremy Block gave an interesting talk on biochemistry modeling using the DiVE, the "cave" or virtual environment cube that has images projected on all six sides. We had penne pasta with eggplant and great desserts, so it would have been enjoyable regardless. Last night I met AE, KD and JH at Chai's, followed by Shade Tree Coffee. We had a lot of fun and celebrated JH's two job offers. He accepted both of them! After that, I went to Duke Plays, a huge party that was an effort by two Duke seniors to provide alternatives to lacrossesque drunken off-campus debauchery. The huge party (and I do mean huge) was hosted in the first floors of the two library buildings. As far as locations, they could not have picked one that was more convenient. I really liked being able to lock my heavy leather coat and purse in my office. The party was open to faculty, staff and alumni and since I qualified on two counts and am even library staff, I thought I should attend. I believe it was actually only the second alumni event that I have attended since graduating seven years ago. The food they served was absolutely incredible. It was all dessert hors d'oeuvres and was all delivered by by roaming people with serving trays. Again, it could not have been more convenient. They served mini-chocolate éclairs, weird little pies with a cherry in the middle, mini-creme brules, mini-white chocolate thingies, chocolate dipped cheesecake on a stick, samosa-like pastries containing warm peanut butter and jelly, canolis, pineapple mousse with whipped creme and pistachios, and more. The two best things were individual spoons filled with orange honey sorbet and skewers with balls of melon and pineapple dipped in honey and chopped mint. Wow. They also had lime sorbet, but I never ended up getting a scoop of that. I got three scoops of the the orange, due to AT's help, for which I am very thankful. It's a good thing they had the roaming serving platters, because it was simply impossible to move once the party got going. I would guess that there were at the very least a thousand people there, if not more. I look forward to hearing the official estimates. It was a semiformal occasion and most of the attendees dressed up quite a bit. The library was almost completely transformed into a glitzy nightclub. There were four different bars, colored spotlights and exhibits depicting recreational activities of Duke students since the beginning of time. There were two bands, Katharine Whalen of the Squirrel Nut Zippers and Pulsar Triyo, both of which I inadvertently managed to avoid for the most part. I spent the majority of the time talking to LA and YB safely between two bookcases. I also got to chat with with several other co-workers, too. I even had a couple of very brief encounters with actual undergraduates, which were entertaining. Was it a success? By most measures, absolutely! I couldn't have been happier with the food and that is, of course, my main criterion of judgment. I had a great time. Alcohol, however, was served and I certainly witnessed some things near the end of the party that suggested to me that not all were partying in the spirit in which it was intended. Today, I saw part of West Side Story. In the middle, it suddenly started freezing up. It would just lurch along. It eventually became ridiculous enough such that we gave up. It's possible that my DVD player is particularly sensitive, because I suspect it's not a particularly good one. It came free with my television, after all. Believe it or not, but I think that this is the only (albeit partial) live action musical that I've ever seen other than Chitty Chitty Bang Bang. Last night I met up with a bunch of my former fellow IBMers at Inchin's Bamboo Garden, in Morrisville. We had a good crowd: CL, JL, PS, KC, GA, and TH. It was particularly fun, because we sat at four tables pushed together into a square, so we always had one group-wide conversation going. The restaurant is owned by a very close friend of PS, so we had lots of inside information about the dishes and PS went into the kitchen a couple of times. It is a small chain and wil soon have six restaurants across the country. They make everything fresh, so it's on the slow side, but that's perfect if you're catching up with friends. They have good selection of Indo-Chinese dishes, both vegetarian and non-vegetarian. I noticed that they do not serve pork. 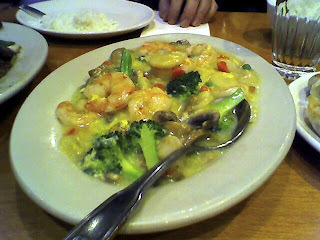 I had a bowl of sweet corn soup with shrimp, which was very good. For my entree, I had vegetable "coins" with manchurian sauce. They reminded me of disc shaped vegetable pakoras more than anything else. I enjoyed it. This morning I went to the latest in the series of talks put on by the Duke Web Communicators Group. It was a question and answer session given by Cory Doctorow, co-editor of BoingBoing, who is also a science fiction writer and activist, among other things. I thought he was very impressive, funny and adeptly imparted a great deal of information in rapid fire fashion on DRM, collaboration, the logistics of running BoingBoing, etc. He also was actually wearing what I believe was an iPod inside his shirt, with earbuds dangling around his collar the whole time. His shirt snapped instead of buttoned, which made the player more accessible. This evening, I went to a second talk, also given by Doctorow, to a much wider audience. This more formal talk focused on a variety of issues, including, but certainly not limited to, privacy, the ramifications of inneffective legislation, the risks of RFID and surveilance cameras. First of all, I'd like to write about yogurt. I've recently eaten a couple of cups of Brown Cow yogurt, which were quite good. Today I had apricot mango and it almost tastes like flavored homemade whipped cream. The coffee flavor was good, too. I've just been amazed at how different it is from Stoneyfield yogurt, which is what I usually eat. I once took a long break from Stoneyfield, because once when I was in college, there was a berry barb in one cup of Wild Berry that lodged itself in the inside of my lower lip. That was a fairly traumatic experience. It tastes good and is very healthy, though, so several years later I gave them another try and I've been enjoying it ever since. Variety is nice, though, so I'm glad that I tried Brown Cow. Yesterday afternoon, there was a hawk that I could see outside my bedroom window. Just as I got out my camera, a second hawk landed in the tree! Friday night, I went to guitar practice after work. We decided to get Chinese take-out from Rainbow Restaurant. 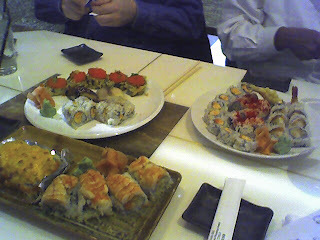 The food was really quite good and better than takeout that we'd gotten from Shanghai in the past. The pork spareribs were great, although apparently difficult to extract from a beagle's clenched jaws. The steamed dumplings were very good, as were the cold sesame noodles. The sauce for the lemon chicken was nice and tart, too. We were all pleased. Saturday afternoon, I spent the day making a necklace and earrings for AC and baking coconut macaroons. Then I went to HC and AM's birthday and Mardi Gras party. That was a blast. Their house was completely packed with musicians, dancers and people gobbling down food. HC roasted a goat, which was loaded with spices and garlic. I'd never knowingly eaten goat before, but it was excellent. With awesome live music on both floors of the house and more food than could even fit in their dining room, it was really cool. After doing some Blackboard testing this morning at 3am, I slept quite late. Then I actually washed some dishes. Miracles occur even here at the Heathen Hovel. My parents and I headed over to ACME for another fine dinner. Weekly e-mail from the owner, Kevin, detailing the weekend's menu do wonders for their business. 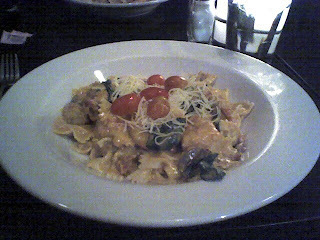 Tonight I had a shrimp and lobster pasta, with goat cheese, tomatoes, artichokes, spinach and bacon. The portions were huge, so we skipped dessert and I took home leftovers. I hope all of you survived yesterday. I wouldn't want any undead readers. I'm very excited that we will be seeing at least another four years of my hero, Keith Olberman, on MSNBC. He's one of the few that probably deserves a 4+ million contract, because he is doing a fine job of educating the public about the activities of neocon scum. I've been eating meals at my various favorite restaurants recently, of course, but I've been ordering the same stuff that I always order. I had a particularly good time with AE, LA and AT at the Thai Cafe last weekend. Afterwards, we went to Sips, the coffee shop in the same complex. I was pleased with my mocha and I'm surprisingly picky about them. The atmosphere at Shade Tree Coffee is a lot nicer, though. I also enjoyed a nice serving of chicken salad at the Symposium Cafe, with DS. Here's a photo of last Friday's post-guitar-practice Cafe Zen sushi. Ok, I also can't forget the tuna and pickled cucumber salad small plate that I had at ACME on Sunday. Last night I went to a wonderful Duke Symphony Orchestra concert with my dad and AN. They played pieces by Abel, Bach and Mendelssohn and it was lovely. Last night, my parents and I went to the Thai Cafe for the first time in a while. I saw and talked to FW briefly. It continues to be a restaurant where I see people I know almost every time I go. I was happy to have a cup of spicy coconut soup and an order of Thai Cafe Baskets all to my self. Fortunately, I also had a leftover basil roll to take with me for lunch today. I didn't have much time to eat, because I went to a yoga workshop from noon to 1pm. It was billed as Office Yoga, so I thought it would be perfect and it was just what I hoped it would be. All the exercises were meant to be done while sitting down at one's desk. I'd barely been exposed to yoga at all, except for some exercises that RB would do in mid conversation when we were in college, so this was a nice introduction. The library has all kinds of wild workshops, lectures and discussions all the time. It's one of the many things that makes it great place to work. Tonight my dad and I went to Eastern Lights for dinner. We shared roast pork with green onion, shrimp with lobster sauce and an order of potstickers. It was all delicious and we had plenty of leftovers to take home to my mom. Thanks to AE, I discovered that Fisher has lots of pens that are way too cool. I've really enjoyed my Swiss Army pen. It writes so much better than any other ballpoint that I've had. Roller balls and fountain pens don't work too well for me, since I'm left handed. I don't appreciate getting ink smeared all over everything. I'm going to resist ordering a bullet pen for at least a little while, though. The last couple of nights, I've been fortunate to be able to watch an almost full moon rise from my windows in the great room, while I've been typing away at the computer. I often like to think about how many thousands of people are looking up at the moon at the same time. No one else, however, gets to look at the moon through the branches of the oak trees surrounding my house. It sounds like a good way to rationalize getting a small tripod, don't you think? One thing I forgot to mention in my previous post was that on Wednesday night I saw the Moscow Soloists perform at Duke's Page Auditorium. I hadn't been paying attention and thought that they were singing soloists, so I was quite pleased to see that they were string players. They started out with a work by Beethoven, who is my favorite composer. This was followed by more modern pieces by Britten and Schnittke. While some of their techniques were interesting, modern "classical" music just isn't my cup of chai. Their final choice for the main program was Schubert, which was very pleasant. Not surprisingly, their encores were the best part. They played a short Mozart piece and followed that with another work by Schnittke that sounded to be primarily klezmer based. That was great. It was also good to see AG in his new role as Interim Director of Duke Performances, even though we'll miss him in the library. I have some catching up to do. I'll attempt to stick to the more interesting bits, but I'm not promising anything. Early last week, I saw V is for Vendetta. I thought it was an excellent movie, because it was both entertaining and thought provoking. Early that week, I also had lunch at the Refectory with NP. This is still noteworthy because I actually finished my equally sized portion of Sopa du Pollo well before he did. It's my favorite dish there. It's basically a "Mexican chicken casserole". Last weekend, KS and DB visited. DB was so adorable, especially when carrying around my stuffed animals. It was really a treat to have them over for the weekend. Saturday night, we went to Chai's with AE, DS, JH and AHB. I had chicken pad thai and I believe KS did, too. (Sorry, RP, I'm just not certain!) 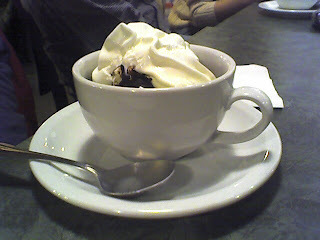 Afterwards, we went to Shade Tree and were joined by JH's friends, L and S. I had a nice cup of cafe mocha and KS had a sundae, which looked very good. Sunday morning, my parents came over and we made crepe style pancakes, which we served with maple syrup and strawberries. I thought DB was very good while we ate. Sometime this week, I saw Everything is Illuminated, which I thought was another really interesting movie. One of the characters sounds very similar to Borat, which makes it funnier than was probably originally intended. It also took me a while to not think of Elijah Wood's character as Frodo and there's one line in the movie that is extremely appropriate for that context. I had lunch with NP again on Tuesday and got to hear all about his wearing a kilt and eating haggis at a recent party. 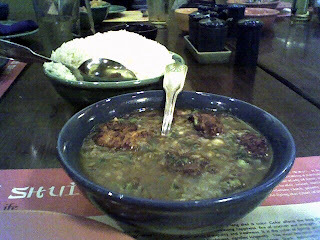 We had chicken and shrimp gumbo, which was good. Thursday was supposed to be the day of our department retreat, where we were supposed to give presentations of research topics that we'd been working on in groups. My group was investigating the future of Learning Management Systems. 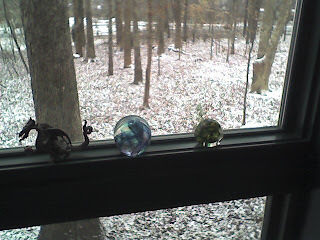 Unfortunately, we had a winter storm warning and I elected to work on ordinary work from home. All the schools were closed, it was snowing when I had planned to leave home and I didn't want to drive there and get stuck. Well, like many of these things, it fizzled and would likely have been perfectly fine if I'd gone. They did apparently have over 300 accidents in Orange County, but the roads at least looked ok. I was disappointed that I missed it, but probably saved myself from a few extra thousand calories in sandwiches, popsicles and candy that way. Friday, I went to the weekly Visualization Forum and listened to a talk by Michael Young, from NC State, on "Leveraging narrative concepts in the automatic construction of interactive experiences". He talked about some of the algorithms used for programming dynamic interactive video games. It was pretty interesting. The spinach lasagna was good, too. Friday night, at guitar practice, I felt as if I actually was making some progress with shifting to and from the B Minor chord on Wild Horses. Afterwards, JJ, JA, EB, MP, HB and I went to El Corral. I had Vegetarian F, which was two spinach quesadillas. That was good. Unfortunately, I made the mistake of ordering a fried banana. I momentarily forgot that their idea of frying something was to add corn flakes. That is actually a nice effect when it's Mexican Fried Ice Cream, but bananas need to be cooked thoroughly before I like them. I need stick to the ones at Kim Son, which are wonderful. This evening, I met AE, EG, JB and LB at Chai's for dinner. It was nice to see LB for the first time, because she's very cute. It was also good to see EG, since I hadn't seen her in over five months. I ordered what was effectively sesame chicken. It was a lot of sweet fried chicken with rice and no vegetables. AE and I went to Shade Tree afterwards and talked for quite a while. 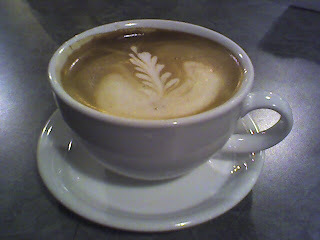 Check out that link, because now they actually have a demo of how they do some of their neat latte art.